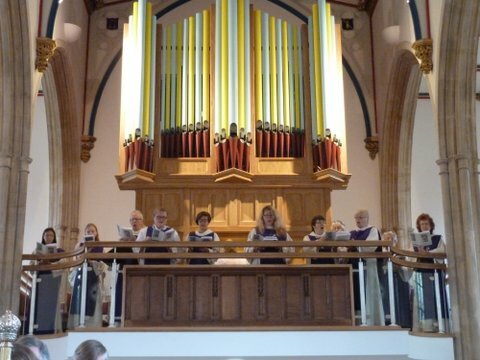 The main purpose of the choir is to lead, inspire and give confidence to the congregation in its musical worship. Choir practice night is Friday from 6.30 p.m. to 7.30 p.m. (during term time only). Practices begin with concentration on breathing techniques and exercises aimed at improving note and sound accuracy. Then comes the ‘bread and butter’ work on hymns. Anthems and carols are also practised for special occasions. On a less regular basis, the choir meets to learn less serious music such as jazz cantatas – music for fun! Some of the younger choristers are musically active in other directions – notably in the school choir and in playing recorders, flute, clarinet and brass. 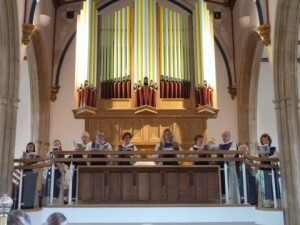 Anyone of any age is most welcome to join this group of musicians to prepare and play music for services and concerts. Responsibility for the musical worship is shared between Margaret Whatley (organist) and Geoff Miles (choir leader). Geoff is also a qualified piano teacher and sings with a number of choirs.